«FDA Laboratory» LLC is the first testing laboratory in Armenia which received accreditation in accordance with the requirements of ISO/IEC 17025:2017, issued by the accreditation body ANSI National Accreditation Board (ANAB). International accreditation allows «FDA Laboratory» LLC to provide reliable data to the international market. This accreditation is a guarantee for Armenian producers/exporters, since having a test report of quality of their products in accordance with international standards, they can enter the international market with confidence. The test results provided by the testing laboratory of LLC «FDA Laboratory» (within the scope of accreditation) are recognized on all continents. The analytical laboratory of «FDA Laboratory» LLC is accredited by the «National Accreditation Body» in accordance with the requirements of ISO/IEC 17025-2005. The laboratory is authorized to carry out its activity in respective fields, accredited by the Technical Regulations of the Republic of Armenia and the Customs Union. 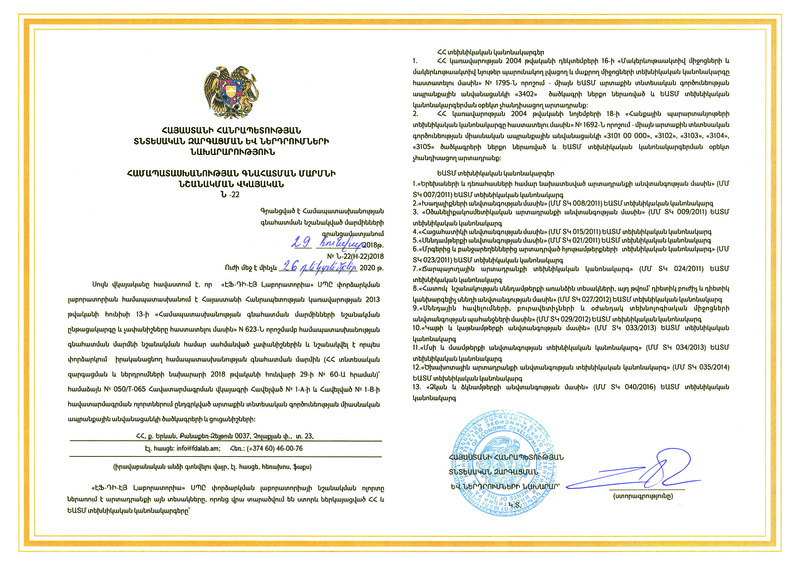 The analytical laboratory of «FDA Laboratory» LLC meets the criteria for designating Compliance Assessment Bodies, established by the decision of the Government of Armenia No. 623 «On approval of procedures and criteria for the establishment of Compliance Assessment Bodies» dated on July 13, 2013 and is appointed as a testing body for the assessment of compliance by the Ministry of Economic Development and Investments of the Republic of Armenia. It also is entitled to provide a Certificate of State Registration.